I work as a freelance composer and sound design in the video game industry. 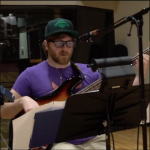 I am a bassist for musical theatre pits, the video game funk band Octorock, and in gigging jazz bands. I have a B. Mus. degree in jazz performance from the University of Toronto. I have been teaching individual students and groups since 2006 both privately and in music schools. Please get in touch if you have any questions or thoughts and we can get making music today.